Betal narrated another story to Vikram. Three men Mohan, Sohan, and Rohan loved a girl named Manju. But before she could choose anyone of them, she died. The man decided to devote their lives to her memory. Mohan started living near Ganga. Sohan always kept Manju's ashes with him. Rohan started staying with a Brahmin. One day, the Brahmin's wife died. The Brahmin put some water from the Ganga on his wife's ashes and chanted a mantra. His wife became alive. Rohan watched the whole incident. He learnt the mantra and decided to bring Manju back to life. 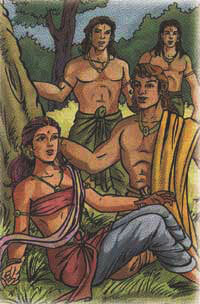 Sohan brought Manju's ashes, Mohan put water from the Ganga on her and Rohan chanted the mantra. Thus, Manju came back to life. Betal asked Vikram, "Whom should Manju marry?" Vikram replied , "Manju should marry Sohan because if he had not kept the ashes, the mantra could not bring her back to life." Hearing this, Betal flew away.